I've seen some amazing flowers done with Stampin'Up! 's oval punches, so I just had to try one. I used both the Small Oval Punch and the Large Oval Punch and layered them for the base petals. The Center of the flower is the large punch. I wasn't going to get this new paper from the Spring Mini, but my friend Jenn said I HAD to get it. 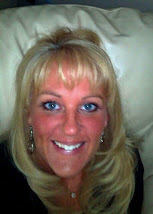 I listen to Jenn... she knows all. I'm so glad that I ordered it... it's GORGEOUS! Au Chocolate Designer Series Double Sided Paper... it's a must have. LOVE It! I made some clippies with this paper too! (I'm sure it will be a favorite) SNORT. I finally made some cute clippies with my Cuttlebug and the new designer papers in the Spring Mini. These are SO much fun... thanks for hooking me up Val and Heather!! These are totally inspired by my friends Pam Hooten and Val Stangle. They are total bombs those two! A lot of you have asked about my banner and watermarks. WISH I could take credit, but it's my AWESBOMB friend Bethie! She has been making banners and watermarks for many of my friends and doing an AMAZING job. She is now doing it for everyone!! What a bargain too.... check it out on her blog Freckled Fun Designs. You won't be disappointed. I ordered some calendars the next day (www.vippies.com). I already had some chipboard coasters from my bomb of a friend Mounds... I mean Joy(www.eclecticpaperie.com). I bought A LOT of calendars. SNORT. So.... I cut up one of my Just Delightful Scrappin' kits that I got for free during SAB, and let my hostess club gals go wild and create. You should have seen the amazing ideas they came up with. I wanted to keep each and every one, but they were set on taking theirs home with them... LOL. I had fun yesterday using up some left overs and making some more of these for friends and family. I also got to FINALLY try the famous big clippies that my brilliant friends Pam Hooten and Valerie Stangle made so popular. Thanks for the die cut Heather! :) Man, I had a great birthday! I'm so blessed with wonderful friends. In case you are wondering, YES... I did use my punches. I used the key tag punch on a sheet of magnets to cut some perfect little shapes for the back. :) See? I'm telling yah.... love my punches. 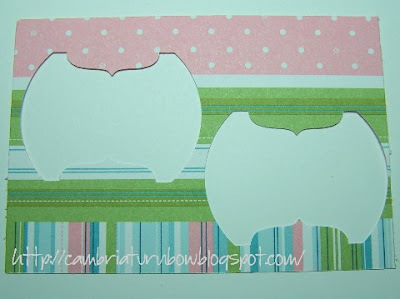 Cut all your paper and strips at 4 inches and you can whip a ton of these out from one Scrappin' Kit. This is how it started..... I had a piece of this beautiful paper left over from a swap and I wanted to make a pretty tab. I turned my punch over and stuck my paper in so that I could see exactly where I wanted my tab to be, then punched. I was thrilled with the cute little tab I had made in seconds thanks to that cool new paper and punch. Then, I started to look at the piece left over. I couldn't throw it away! I got out some whisper white card stock and started measuring until I got a piece to slide in. You need the width to be 1 7/16 to fit perfect. The height will depend on how long your piece of paper is. You can see my end results here. This piece started out the same as above, I was going to slide a piece of whisper white in the middle. I ended up cutting this in half and using it on just the bottom of this card , but you could do the same and add one to the top and one to the bottom. 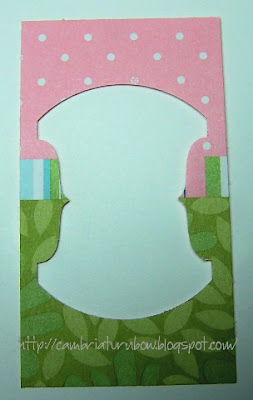 It is much easier this way because you can cut your card stock any width you want and just add the accent. No trying to measure the top of one and the bottom of the other. You can then trim the bottom part to show as little or as much as you want. Hope this all made sense. Can't wait to see what you do with your new Round Tab punch! See the little tab thingies that "hold" the flower? 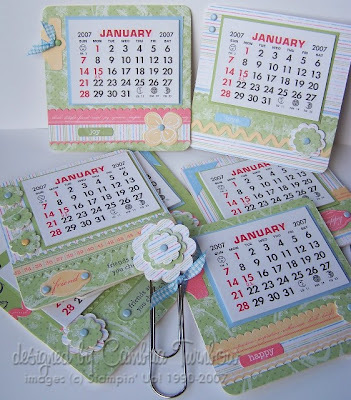 Those are made with the new Round Tab Punch, that will be available in the new Spring Mini Catalog March 1st. I was initially trying to just make a cool little tag for the side (which you can also see in the photo that I stamped joy onto), then I saw the little left over piece sitting on my desk, looking so lonely. 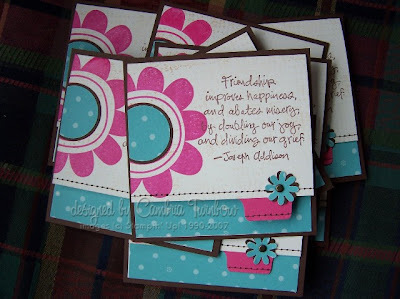 Well, I just HATE wasting that beautiful new Petals & Paisleys Designer paper (also available in the new Spring Mini). So, I cut a piece of whisper white and played until I got it to slide in there. Now, that got my mind turning and I couldn't put the punch down!! 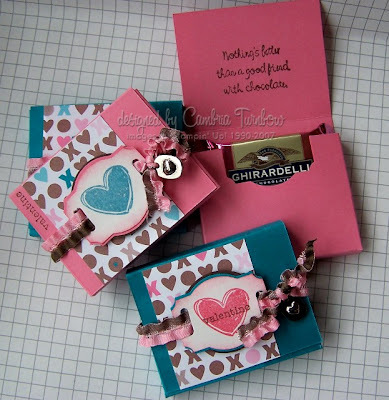 This sweet little set is also a new one, which we as demonstrators got for FREE from Stampin'Up! during Christmas. That Shelli is such a BOMB.... she is always thinking of us demos. Just one of the reasons I love being a demonstrator for SU!. If you joined the Stampin'Up! family this month, you also got this set for FREE in your starter kit. And, next month as a customer, you can get a great deal if you purchase this set, that AWESBOMB paper, and the matching jumbo wheel (see the card below). Buy all three and get any other set in the mini for HALF Price!!! Yah baby... you heard me any other set for half off!!! This is a 4 1/4 x 4/1/4 size card. My last swap for the Spring Mini. My customers are going to love the samples I'll have for them.... but my wrists hurt. LOL. This is the biggest flower from Big Blooms, with the new Designer Paper Petals and Paisleys. 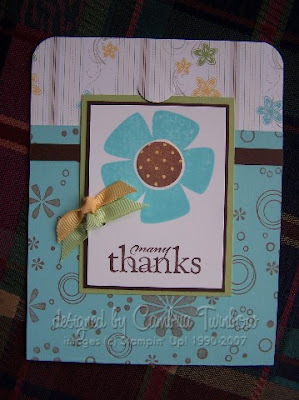 I also used the Texture Jumbo Roller wheel in creamy caramel over the white before stamping the flower. I am horrible at shabby. It's SO hard for me to make it look worn, vintage, shabby (whatever you want to call it) without looking plain ole dirty and just messed up. So, for me, the Texture roller wheel is a life saver. The little tab hanging down is made with the new Round Tab Punch. I just punched it out in pink passion, then cut it in half in the middle, then glued it on with the big part under. 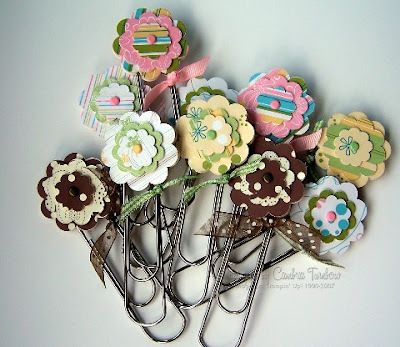 The flower is from the DS paper, and chocolate chip card stock, made with the flower punch, attached with a vintage brad. Faux stitching along the bottom of the card front and the tab.... gotta love faux stitching. :) I'm done!!!! Next... workshop stuff. It's always something huh? Here it is... the pink version. This is also the "Mish Closure". I LOVE all the new paper in the upcoming Spring Mini Catalog. 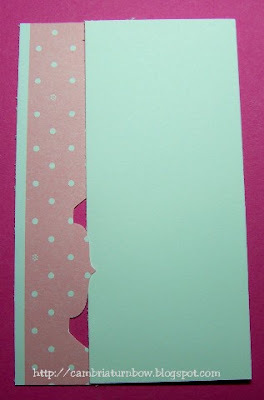 This style card is perfect to use with any designer paper. Your colors are already selected for you, and you only need a small strip to make a really great card. I used the new set Big Blooms for the main image. Polka Dots & Petals for the center of the flower. 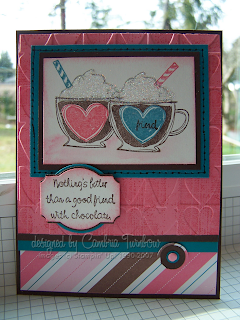 That is Close to Cocoa Craft stamped onto Regal Rose, then punched out with the 3/4 Circle Punch. The bottom portion is the new Jumbo Wheel Petals in Whisper White Ink. This Designer Paper is the new Double Sided Petals & Paisleys. All available in the new Spring Mini March 1st. This card uses the "Mish Closure". My friend Michelle Wooderson is the master mind behind this cool card fold. She is totally amazing. You just cut your card stock 4 1/4 by 11, fold in half, then cut off 1.5 inches off the top of one end. 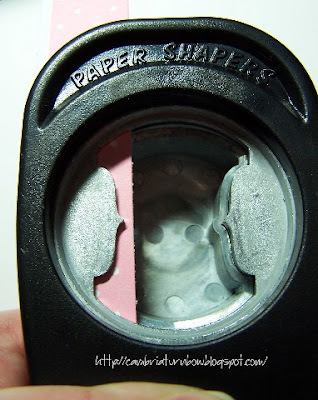 Cover the back with a strip of designer paper, then use your slit punch in the middle and pushed all the way in. Make your front piece, then add your adhesive to the bottom portion, stick it under the slit punch and you are done. Card open and closes from the top, under the slit punch. People really love these when I send them in the mail. Give it a try... you'll be surprised how easy and addictive this style of card is. I'm in this big swap every mini. I really struggle with swaps, especially the big ones. I don't know why making the same card over and over just drives me nuts... it's torture. The only thing that gets me through is that I KNOW all of the swaps I get back are amazing. My customers LOVE them. ;) This one was 42. I didn't have enough paper, so I made another very similar, except for the paper and wheel color. I really loved this one, until I had to do another with different paper, and then the other one had pink. I'm torn, but I like them both and I hope the other swappers like them too. This is again not Stampin'Up! paper, but some that a super good friend sent to me. But, I got my Big Blooms set from the upcoming Spring Mini and I just can't wait to have more fun playing with it. 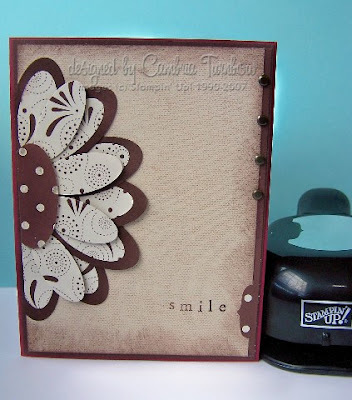 The center of the flower is popped up on Dimensionals punched out from part of the patterned paper with the 3/4 inch circle punch from Stampin'Up!. 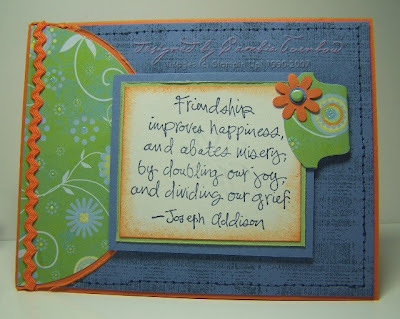 Sentiment is from a set called Small Sayings from the Winter Mini... which is a favorite for sure. ;) This card is designed to fit in our new small open-ended envelopes. 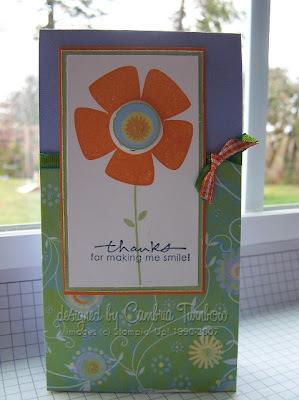 Big Blooms.... a new Stampin'Up! set available in the upcoming Spring Mini catalog. I can never get enough flower stamps. I used my 3/4 circle punch to punch out paper for the center of the flowers and also added colored brads. 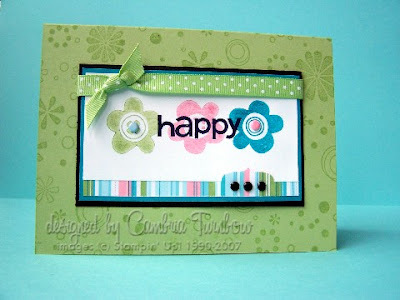 I love that Stampin'Up came out with colored brads.... they really add a nice touch to your projects. 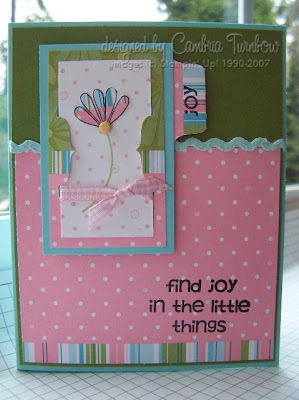 Paper is called The Pocket Full of Posies Stack, by DCWV. It is all 8x8 and it's amazing! My friend Heather sent it to me and I'm having a blast playing with it. Thanks Heather! Ribbon is from May Arts and was purchased from Starlitstudios. 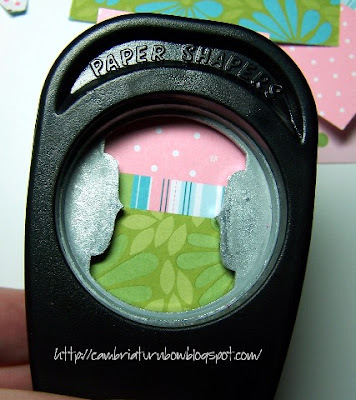 You can't see from the photo, but I also used the Linen background stamp from Stampin'Up! at the top of the card. It really gives it texture. 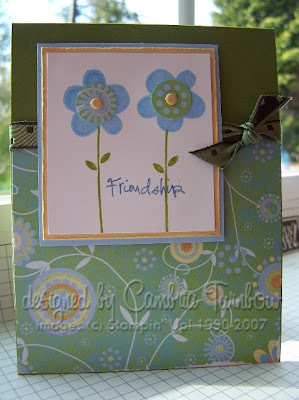 The friendship was from the Friendship Flowers stamp set. Hope you all got some stampin' therapy in this weekend. So.. why in my head did I want to add balls at the end of that title? LOL. Jenn... This girl takes the brunt of a lot of frustration from a lot of people, and over the last few days, she took the brunt of my pain. I'm sorry for that Jenn. Thanks for the encouragement to do what's best for me. Thanks for being there always and for being such an awesome friend. Thanks for always hanging tight baby. I know, bare with me, but I truly do love SUDSOL. It stands for Simply Unique Demonstrators Sharing Online. www.sudsol.org. I joined for the free trial membership shortly after I became a demo and I'll stay till they kick me out. The information and help has been invaluable to my Stampin'Up! business. This little pattern was shared by Patti, who is one of the main chicks over there. She is always answering questions and steering everyone in the right direction. She's a bomb. :) Anyway, this little box holds one Ghirardelli chocolate. The only thing I added was using the Designer Label Punch from SU! half way down on the inside to make it easier to grab that little piece of chocolate bliss from the card stock. These are made to coordinate with my Latte cards. Man... if you are demo and need some help with your business, go and check out a free two week trial of SUDSOL. Once you are a member, there are lots of ways to earn free months of membership for participating. It's a win win scenario (Cat In The Hat in my Head). Oh, I'm a dork. Cut all the way down to the first score line from the short side on the 3/4 score line. Then cut from the side so you have a big T shaped. fold up, add your pretties and you are done. If you want at tutorial, then you have to check out SUDSOL. :) They even have photos. Like U a Latte Joni girl! So this is something I've been doing a lot lately..adding the little slit punch to my cards. I LOVE my slit punch. I love the little detail it adds. Man... I say love a lot. SNORT! I also used the Cuttlebug with the hearts folder for the background on this one. 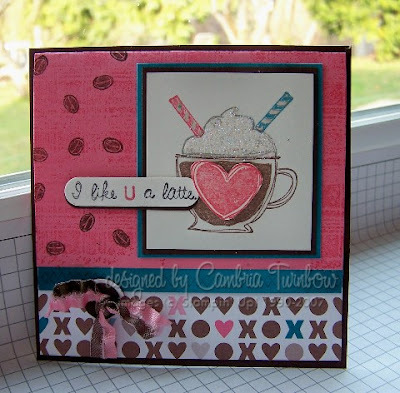 I really LOVE this set from Stampin'Up! called Like It a Latte. So... didn't think I'd ever do the blog thing. But... some of my friends are insistant that I should try it and MADE me do it. (wink wink Bethie). So now what? Bethie... I need help! I really don't have much to say, but I promise to share what I'm stamping, what inspires me, and maybe inspire you a bit along the way.